Los Angeles, CA - LanternLock LLC made Hollywood sit up and take notice with its innovative lighting fixture LanternLock 1SM. Metal Products Engineering helped LanternLock develop new improvements for the construction of the fixture and now produces that part on their waterjet machine. A staple in the film and video lighting business, so called "China Balls" have been used since the inception of modern film lighting. China Balls are popular fixtures because they provide fast, inexpensive, and flattering diffused lighting. Unfortunately, traditional paper lanterns are flimsy, and their light is difficult to control. 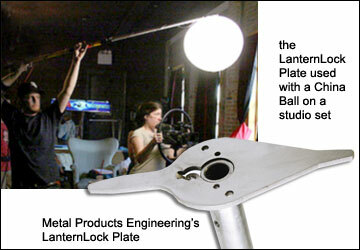 The innovative affordable solution from LanternLock® makes China Balls a safe, precision lighting instrument. Industry lighting engineers enthusiastically agree as evidenced by the product's rapid acceptance on movie sets around the world. Metal Products Engineering frequently works with designers and engineers to help them bring their visions to reality and their products to market. Recent projects have included everything from furniture and jewelry items to challenging projects for the military and the lighting industry. The one thing that remains constant is Metal Products Engineering's focus on providing quality and cost effective solutions.